Recently, I was hanging out in Venice with some colleagues when a guy showed up and started talking training with me. He had a typical male body, about 5’11” and 170 pounds. In other words, you never would’ve mistaken him for an MMA fighter, much less a bodybuilder. So it’s no surprise that he wanted to add muscle to his frame. Poor Arnold – no one wants to look like him. I’ve heard the “I don’t want to gain too much muscle” plea countless times. It always gives me a good laugh. That’s because gaining five pounds of muscle, or 50 pounds, requires the same initial approach. I guess people think they need less of some variable (load, frequency, volume, etc) when they’re avoiding the “muscle bound” look that Schwarzenegger’s name has become synonymous with. Gaining quality muscle mass takes time, even when you do everything perfectly. So there’s no need to worry that you’ll wake up and be burdened with a bodybuilding physique that compares to someone with one-in-a-million genetics who trains all day, eats all day, and uses steroids. In 15 years I’ve never heard a natural guy claim he gained too much muscle, too fast. (If you happen to be that guy it’s likely that you’re not reading this blog.) The bottom line: if you want to gain muscle mass, do everything it takes to build it as quickly as possible. Once you’ve added enough muscle to suit your needs, then it’s time to consider dialing things back (the solution is as simple as eating fewer calories). Furthermore, most guys need more muscle than they initially think before they get the look they’re after. The number one reason why guys aren’t gaining muscle faster than “really slow or not at all” is due to their nutrition plan. Your body must have the raw materials it needs to build muscle or else it’ll never happen, regardless of what training program you’re following. Think of building muscle the same way as building a house. Your training program is the blueprint; your nutrition plan is the raw materials. A blueprint without raw materials gets you nothing. So, if you’re someone who wants to gain lean muscle mass, regardless of how much it is, immediately put these nutrition principles into play. Calories: The first step for a muscle-gaining diet is to consume enough calories. A good starting point is your lean body mass (body weight – fat) x 16. So if you’re a 170-pound guy with 12% body fat, that means you have 150 pounds of lean body mass. You should eat 2400 calories per day as a starting point. If you’re not gaining quality muscle (the scale reads the same after a week), add 200 more calories each week until the scale starts going up. 2400 calories might sound low, but it’s not when you eat the foods that I outline here. The reason most guys think they need more calories is due to two reasons. First, they eat low-quality foods that are void of muscle-building nutrients. Second, their digestive tract isn’t healthy so they can’t assimilate all the nutrients they’re getting. Protein: Consume one gram of protein per pound of lean body mass (150 grams per day for 170-pound guy with 12% body fat). That might not sound like much but it’s plenty when you get your protein from whole foods such as eggs, organic chicken, grass-fed beef, wild fish, etc. Your body can assimilate a greater percentage of the amino acids from whole food sources, that’s why you don’t need as much as if you just consumed protein powders. Each gram of protein has four calories, therefore, 600 of your calories come from protein. The only time I recommend protein powders is directly after your workout, as I’ll discuss later. Fat: One-third of your calories should come from high-quality fats such as olive oil, coconut oil, fish oil, and the fats found in your whole food sources. Each gram of fat has nine calories. Since you need 790 calories’ worth of fat, you’ll need 88 grams per day. Carbohydrates: Now you’re left with 1000 calories’ worth of carbs. Each gram of carbohydrate has four calories so you’ll need 250 grams per day. Yams, quinoa, oatmeal, wild rice and fresh fruits are ideal sources. Workout Nutrition: What you consume directly before and after your workouts has a huge impact on how quickly you’ll recover. The faster you recover, the more often you can train. Put another way, recovery is key to adding more weight to the bar, or cranking out an extra rep with your next workout. 15 minutes before training: Take 10 grams of branched-chain amino acids with two grams of beta-alanine. I use Biotest’s version of both. Immediately after training: Take 10 grams of branched-chain amino acids, wait 10-15 minutes, then drink two scoops of Sun Warrior protein mixed with five grams of creatine powder and eat 1/2 cup of organic raisins. If raisins aren’t your thing, mix 8 ounces of grape juice with 8 ounces of water, stir in the protein powder with creatine and drink. Become an Alky: The only downside to eating plenty of protein is that it can be acidic and inflammatory to your body which, in turn, slows recovery and causes joint pain. This is especially true if you eat a lot of dairy. Therefore, I must emphasize that you need plenty of green vegetables in your diet. Don’t worry about counting them as calories since they contain little to none. Put fresh spinach in your morning omelette, have a salad topped with veggies at lunch, and eat broccoli with grass-fed beef at dinner. These are just a few examples. I’m also a big fan of Green Vibrance from Vibrant Health. I take two servings each day mixed in water to ensure that my acids stay in balance. Get More From Your Food: What you put in your body isn’t as important as what your body can assimilate. A healthy GI tract is essential for maximizing nutrient uptake. Think of your GI tract like the gas tank in your car. If your tank is full, adding more gas won’t help since it’ll just spill over. And if your GI tract is lacks hydrochloric acid (HCl) and other important digestive enzymes, adding more protein won’t help since your body won’t be able to break it down. If you have gas or bloating after meals, or if your breath smells like a diaper filled with rotten Indian food you might have HCl deficiencies. HCl’s role is to help your body assimilate nutrients and kill off bacteria. When it’s low it limits the amount of protein and calcium your body can absorb. Now, I must mention that treating HCl deficiencies and digestive disorders is best left to your qualified physician. I can only mention what works for me. Don’t go into this blindly or else you could cause damage. The first step for correcting an unhealthy digestive tract is to eat plenty of vegetables and take a fiber supplement, if you can’t stomach the idea of adding veggies to your diet. As a side note, people who follow a vegan diet for a few weeks almost always improve their recovery, diminish joint pain, and boost their overall energy. Don’t get me wrong, I think there are limitations to a vegan diet since it’s difficult to get enough protein. But it’s worth mentioning that adding a lot of fruits, vegetables, and fiber-rich foods can help you gain muscle. The reason? A vegan diet improves your gut health. That’s why I recommend a vegan protein powder. I could never follow a vegan diet for long before I hijacked Umami Burger or spent my retirement at Wolfgang Puck’s Cut in Beverly Hills. Therefore, I use digestive support from Premiere Research Labs. I take one capsule of Quantum Betaine HCl and one capsule of Quantum HCl Activator with breakfast, lunch, and dinner for three weeks. Then, I take one Quantum Betaine HCl with meals whenever I’m stressed out (yep, I haven’t stopped taking them yet). This entry was posted in How To Build Lean Muscle by Dr. Chad Waterbury. Bookmark the permalink. 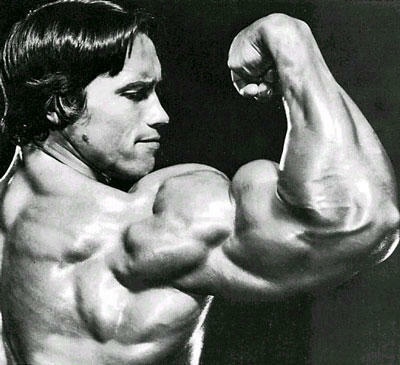 “Poor Arnold – no one wants to look like him.” Classic!!! Nice post, very informational. I wish I could take boatloads of BCAA, but only take them a few months out of the year as I can’t justify the constant cost, but I may have to look in the HCl supplementation. Are you still a believer in supplementing with borage oil? They offer a rice protein concentrate at a substantially lower cost than the SunWarrior product. Is there a reason why Sun Warrior’s product would somehow be superior so as to justify the steeper price tag? If so, I’d gladly continue ponying up for it, but if not, it would seem silly to continue paying more for a product that provides no additional benefit. Any thoughts on this front would be appreciated. Note: I am a fan of SunWarrior’s product, so this is not meant to bash it, simply a case of trying to maximize my nutritional dollar without sacrificing quality and any noteworthy contribution to results in the process. Lou, I’m not familiar with the brand you linked to. I only recommend products I use and have had great success with. Sun Warrior has been outstanding, but give your product a try and see which you like better. You can still get plenty of BCAAs in a scoop of whey protein, assuming your gut can handle it. Borage oil is good, but sometimes it’s easier to just take GLA capsules. I’m also a big fan of coconut oil and olive oil. Bret, thanks for stopping by! I am an owner of your ‘Huge in a Hurry’ book, which is where I was first introduced to your excellent fitness and training writing and more recently am now trying your 10/10 system (just beginning week #5, so far so good lol). I have a couple of questions about your advice in this article as it relates to 10/10. First, as a minor question, do you prefer greens+ or green vibrance? Main question: I am interested in your thoughts on BCAA supplementation, which I am completely new to. In 10/10 you suggest taking them in each instance along with other food, be it a snack before bed or with carbs and protein before and after workouts. I read elsewhere that its better to take these on an empty stomach so that their absorption into the gut would not be delayed by the other food’s slower digestive properties. Since I was following your program and not that of ‘random internet poster’ I decided to stick to the letter of your plan, but now I notice in this blog post you advise that the pre workout BCAA’s be essentially taken on an empty stomach and post workout that you take them 10-15 mins prior to additional protein and carbs. Therefore I just wanted to ask you if I should adjust the advice in your 10/10 plan to allow for BCAA supplementation on an empty stomach instead? I\’m curious as to how a vegan diet could improve gut health. I was wondering whether you could provide a sample meal plan to go with this article to show how you would structure all of these foods into a day of eating? I assume that it would be similar to your eating plan in ‘Huge in a Hurry’, but simply with added carbs? Like having oatmeal with eggs at breakfast, sweet potato with a salmon salad at lunch and wild rice with a grass fed steak in the evening? I live in São Paulo, Brazil. A couple of years, when I was in U.S, I bought your book (” Get Huge in a Hurry”). I’ve been following it since then. My question is about the Diet Plan. In the book, you recomend get most of the calories from fat and proteins (Carbs are restricted to fruits and vegetables). In this article, you show a little diferent diet plan (more rich in Carbs). So, I know there are many kinds of diets, but, between these two diets, which one do you like best? And “why”? Finally, I’d like to say that I really admire your work. Sorry about my English by the way. Nelson, you’re right, these diets are different because the goal is different. For fat loss, it’s better to eat fewer carbs. For muscle growth, you need carbs for recovery and energy. That’s why there’s a difference. Eating to bulk and eating to get shredded require different approaches. John, a vegan diet drastically reduces inflammation and it floads your GI tract with healthy enzymes that promote digestion, assimilation, and motility. Don’t get me wrong, a pure vegan diet has its limitations, but overall it’s a great way to eat short-term to get your body/GI tract back in balance. Amir, BCAAs can be taken on an empty stomach, or with food. It just depends on the goal. Pre and post-workout it’s best to take them on an empty stomach to speed the rate they’ll get to your muscles. I have been using SunWarrior and organic raisins after each workout, but the raisins are a little tough on my stomach (I have a weak stomach). 40g of raisins seems to be my limit before it bothers me too much. Do you have an alternative for post-workout carbs second in line to raisins? Thanks. CW: 40 grams worth of carbs from organic cranberry, cherry, or grape juice will work, too. Make certain it’s organic. Chad, what would you recommended as pre-workout nutrition and post-workout nutrition coming from actual whole foods? Supplements are too expensive for me and I prefer to get all I need from real whole foods. Thanks! CW: I prefer to do all training in a fasted state in order to keep the sympathetic nervous system cranked up and force the body to use fat for fuel. After a workout grilled chicken and white rice works well. 30g of protein from chicken and 60g of carbs from rice is a good place to start.